Planned Maintenance can integrate with your Inventory account in two different ways. This is determined by a setting listed on the Account Information page in Planned Maintenance. Click on the Account Setup tab and then click on the Account Information link. Check this box to allow your PM Schedules with Inventory items listed in Step 13 to automatically create an Inventory Issue Transaction when the PM Work Order is generated. This will automatically issue the inventory for the quantity requested (reducing your On Hand Quantity) as long as the inventory item itself has enough On Hand Quantity. The worker can then just pull the item and do the work, without having to create any other inventory transactions. However, if the On Hand Quantity of the item is below the requested amount, the system will generate an inventory request instead of an Issue Transaction. If the above box is not checked, it will result in the system creating a request for inventory items instead of automatically issuing them out. These requests can be found in the PM Work Order Needing Supplies section of your Inventory home page. They can then be issued or declined on an as-needed basis. In Step 13 of your PM Schedule, you will define the parts needed to complete this PM job. Make sure that you are selecting the Transaction Type of Inventory. Click Submit. You can enter multiple Inventory items on a PM Schedule. Be sure to only include the parts that need to be issued every time a PM Work Order is created. 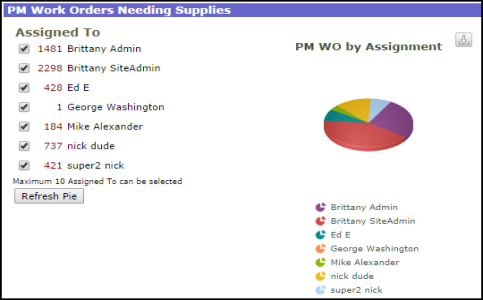 Once a PM Work Order with an Inventory item is generated, that request will appear in the PM Work Orders Needing Supplies section on the home page of your Inventory account. The requests will show up based on Assigned To and Location. From either graph, click on the request number for the PM Inventory that you need to issue. You will see a list of requests that have been generated by the PM Schedules. Click on the WOID Number for the request you would like to process. Update the Issue Quantity and check the box under Issue. Make sure to check the Mark PM WO as issued box, unless you are not issuing the full requested amount.